Tony writes: This has become my summer of grilling the un-grillable. Nothing dramatic, mostly tiny vegetables like green beans or chiles or grape tomatoes, which I had never dared grilled for fear of losing through the grill grates. My method is simple: I set a cross-hatched cooling rack on the grill. top with the tiny vegetables, and cook, flipping (or rolling) so they brown and pick up smoky flavor and soften a bit. 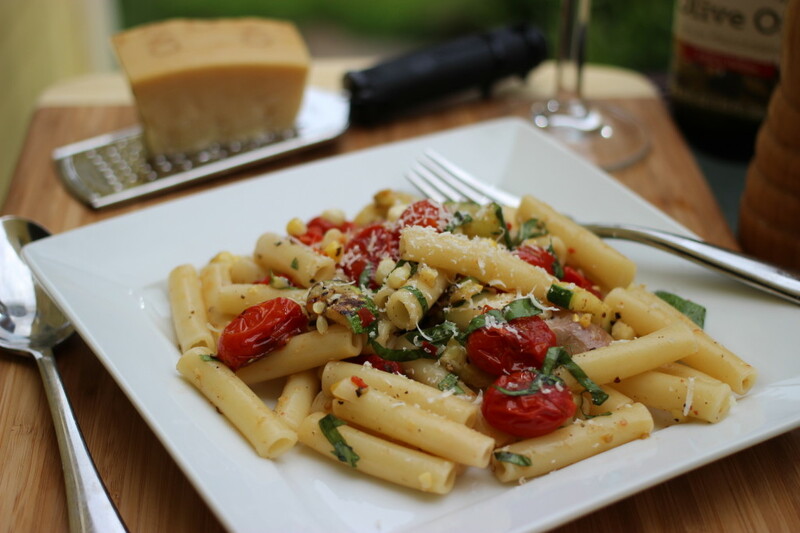 The technique is great for summer salads, but I recently realized it works equally well with summer pastas. Here’s my favorite version: The Recipe: Serves 4 to 6. 1. Get started: Heat a gas grill to medium-high or prepare a medium charcoal fire. Bring a large pot of water to a boil. 2. Meanwhile, prep the veg: Thinly slice 3/4 lb. zucchini (2 medium) into long planks. 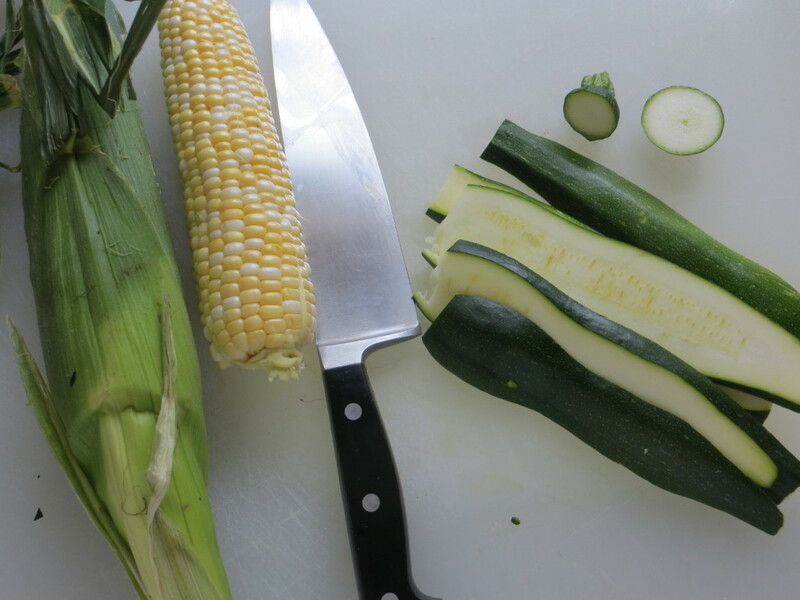 Shuck 2 ears corn; use a towel to remove any silk. Rinse and pat dry 1 pint grape tomatoes and 1 to 2 jalapeno peppers. Sprinkle the vegetables with 2 Tbs. olive oil and sprinkle generously with salt and pepper. 2. Grill the ingredients: Set a cross-hatched cooling rack flat over one side of the grill. Top with the tomatoes and jalapenos (you can just slide the tomatoes onto the rack). 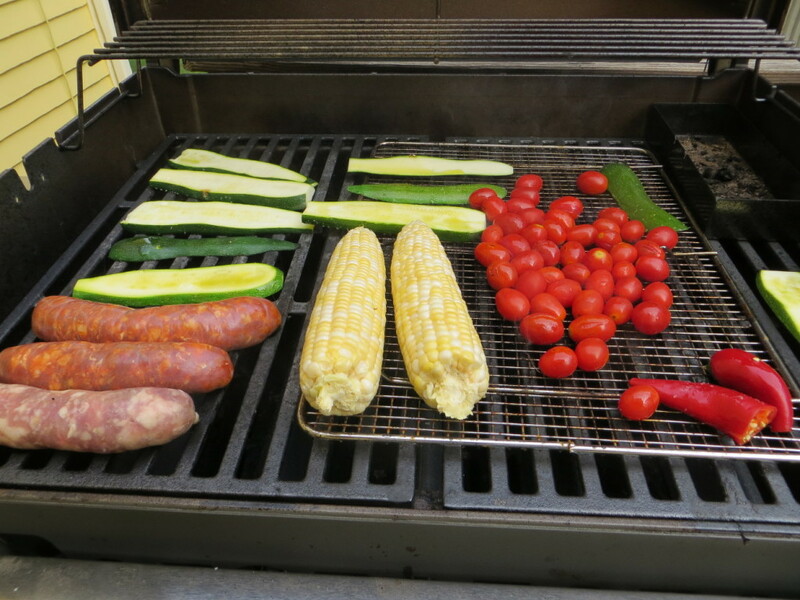 Set the corn, zucchini, and 3 links Italian sausage (about 1 lb) on the other side of the grill. 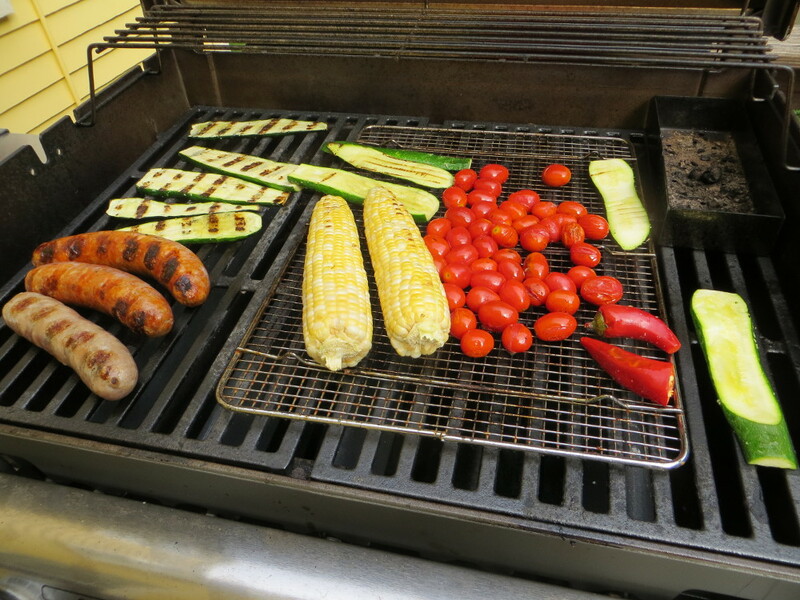 Grill the tomatoes and jalapenos until they brown and soften, but don’t burn, 3 to 4 min. Grill the zucchini, flipping after 3 min, until it browns but is still firm-ish, about 5 min. Grill the corn and sausages, rolling over every couple of min, until the corn browns and the sausages completely cook through, 8 to 10 min. Transfer all of the grilled ingredients to a large platter to cool. 3. Cook the pasta: While the vegetables are cooling, cook 1 lb. penne (or any other smallish, tubular pasta) in the boiling water, stirring, until it softens to a tender, but toothy consistency, about 10 min. Drain well and transfer to a large platter. 4. 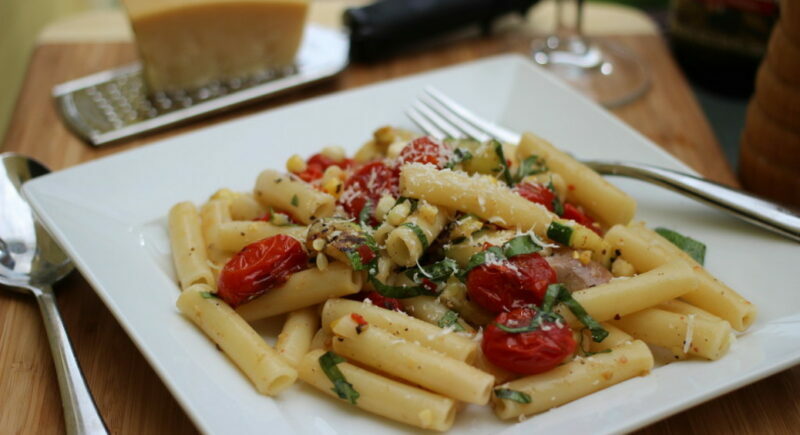 Chop, toss and serve: Remove the corn from cob and add to the pasta along with the grape tomatoes, 1/2 cup grated Parmigiano, and 12 basil leaves (torn into large pieces). Thinly slice the sausage and the zucchini and chop the jalapeno. 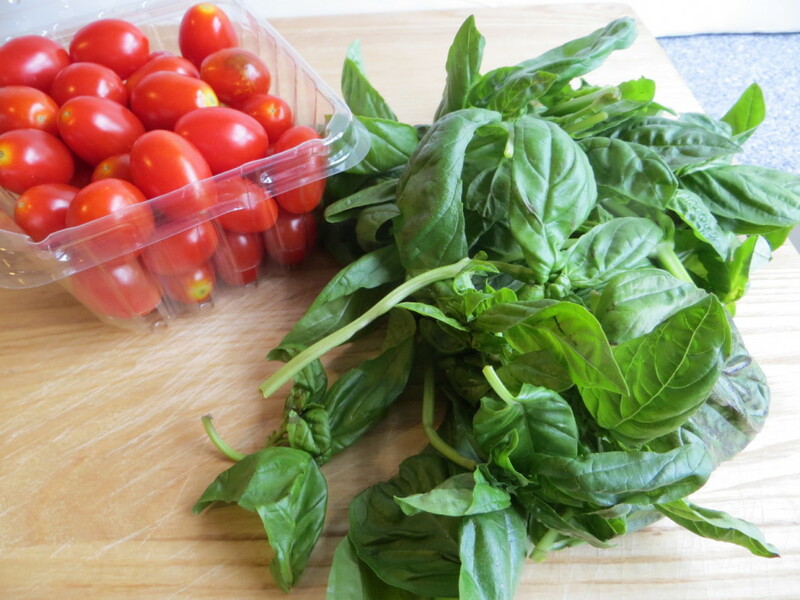 Toss all three with the pasta, and season generously with salt and pepper to taste. Serve, sprinkled with a drizzle of good olive oil and more basil and Parmigiano.